The past month has been mixed for JPM's head quant, Marko Kolanovic. On one hand, just days before the Feb 5 quant puke, he published a report, predicting that the late January selloff would not lead to widespread systematic liquidations. A few days later, on "Volocaust Monday", that's precisely what happened and to a never before seen extent. Then, in keeping up with his recent cheerful outlook, shortly after the selloff, Kolanovic doubled down, and said that after the initial deleveraging of quants, vol-sellers, CTA and risk parities, the forced selling is now over and it was safe to buy the dip. Here, his call has been far more accurate, as almost nothing is left of the early February 10% correction following a barrage of BTFDers. In fact, the speed of the rebound appears to have surprised Kolanovic himself, and in his latest note, published moments ago, he writes that the subsequent one-week rally was very fast (~99th percentile one-week up move vs. S&P 500 trading history). As such, "the question is: What might the market do next?" To answer this question, Kolanovic first looks at his favorite indicator, capital flows, and specifically "the positioning of investors and expected flows", especially among the systematic, vol-targeting funds. First, we note that the Hedge Fund beta to equities experienced an unprecedented drop over the market sell-off (Figure 1). This de-risking (and in some cases shorting) happened largely via buying of downside options (and selling of index products) and might not be entirely captured by prime brokerage data. For instance, open interest on index put options rose by ~$500bn shortly after the sell-off. 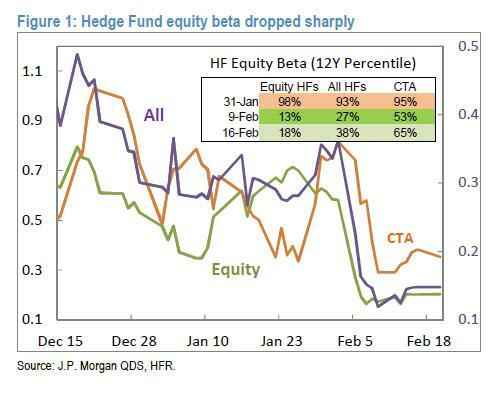 Hedge funds went from a near-record-high equity beta, to a near-record-low equity beta. This move started to revert last week, but has plenty of room to increase (table in Figure 1). In terms of systematic selling, this is largely over. In fact our models show that volatility targeting strategies may now start very slowly rebuilding their equity positions. Then there is the potential bid from pension funds, whose rebalancing at the end of the month could make for a rare buying imbalance, something we discussed two weeks ago in "An Unexpected Consequence Of Last Week's Selloff"
One should also keep in mind that most pension funds rebalanced at the end of January, and global markets are now ~5% lower from that point (~90th percentile by size of the drop). Next week is month-end, and buying from fixed weight allocators could be substantial. These flows will be a headwind for any near-term bearish thesis. We have, for instance, heard theories that the market ‘needs to re-test’ the bottom quickly. This seems to be a somewhat arbitrary argument with no significant structural or statistical evidence to support it. A second thesis is based on fear of rapidly rising yields and inflation. While we think that inflation and yield fears are overblown near term, this is more difficult to disprove. We would like to point to the record speculative bond futures shorts from both fundamental and systematic investors. 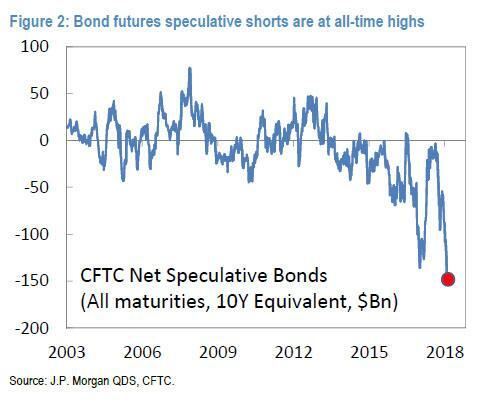 Figure 2 shows that speculators have amassed the largest short position in the history of bond futures trading. When there is such a large short position, there is always risk of profit taking, or worse a proper short-squeeze. Looking at the longer-turn, Kolanovic points out that the biggest threat remains one of deflation, not inflation, based on the three Ds: demographics, debt and disruption. We also note extreme sentiment swings and the media playing into fears of inflation, while largely ignoring important points such as those most recently voiced by the Fed’s Harker and Bullard. Inflation discussions have recently centered around ‘linear extrapolation’ of inherently noisy data points, and focus on ‘old news’ (e.g., the nearly month-old Fed minutes yesterday). There is no mention of structural deflation via demographics or technology/AI. Selling of equity index risk premia (via implied correlation, volatility, skew, etc.) is a strategy that underwrites insurance on an inherently risky asset. These strategies are well documented (over 3 decades) and have strong theoretical justification. The risk-reward profile of these strategies is highly ‘non-Gaussian,’ and there is a trade-off between the typically high Sharpe ratio but also high downside tail risk. Over time, and when properly risk-managed, these strategies work well (equally well as underwriting insurance, e.g., for natural disasters). Fires, hurricanes, and market sell-offs do happen, and this is a normal part of an insurance strategy cycle. Of course one needs to understand the risk/reward, and manage exposure and tail risk. This is where some investors or products might have miscalculated and suffered large losses. If one is collecting a 20% or 30% premium (return) per month, one should suspect that there is a significant risk for the loss of entire principal (e.g., similar as with credit – which is another form of insurance). We pointed to this in our previous reports and it was covered in press extensively before the recent events. However, history shows that insurance strategies tend to work better in the aftermath of ‘disasters,’ when the level of premia is elevated, there is less market participation and leverage, and the probability of another tail event might be lower.